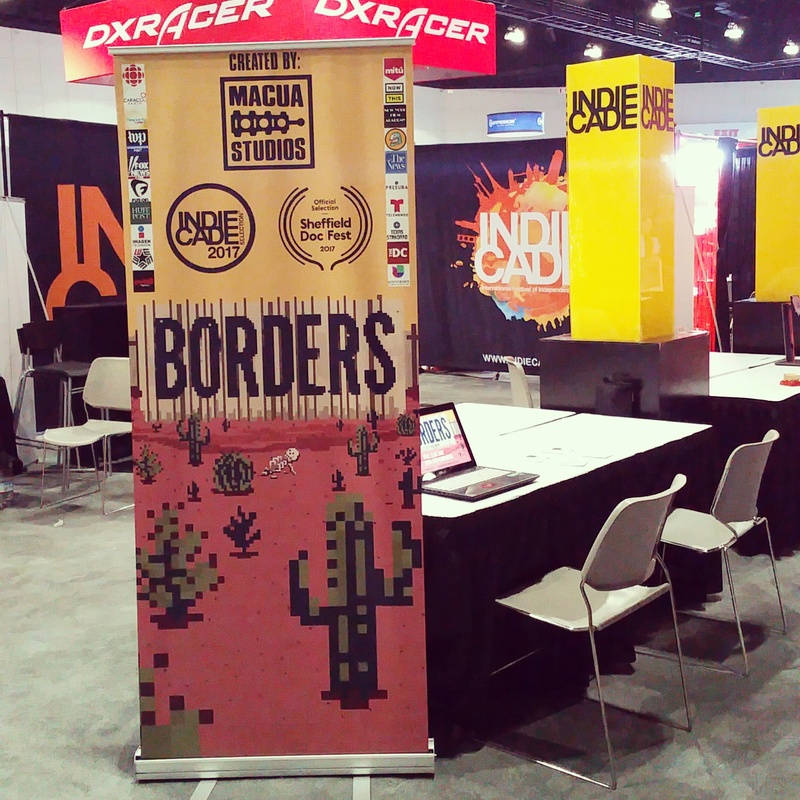 Borders at Indiecade Showcase @ E3! So recently our team at Macua Studios was busy showing off our first game Borders ALL AROUND THE WORLD! Jon Digiacomo and I (Gonzalo Alvarez) showed off Borders at the Indiecade Showcase at E3 while Genaro Reyes flew overseas to show it off at Sheffield Doc Fest in the UK. It’s surreal to think that exactly 1 year ago we were all just learning how to make games, and a year later we were presenting our first game at the most prestigious events! We got an awesome banner (not biased at all) and set up our booth with two computers. Just to catch people up to speed, Borders is a 2D stealth game about immigration where players attempt to cross over the border, but every death leaves behind a permanent skeleton in the map. We had a computer with a clean slate just for the people at E3 and then we had one with the 1500 bodies brought over from the installation I had set up in Texas. The game received a lot of attention, more so than I would of expected and it was pretty much busy at all times. We had a lot of press coverage, and most importantly, a lot of people truly enjoyed the game! In fact we had a couple of people come back just because they wanted to beat it. Our first person to beat it spent 40 min trying to figure it out and that was an honor. By the end of the 3 days of talking till our voices were out, we had gotten over 600 skeletons in the E3 computer and over 2300 bodies total alongside the traveling build from Texas. I am so glad that many people not only found the game interesting, but understood the concept behind the game and really enjoyed my parent’s story. This was an experience we could not have seen coming and we are so glad that this has allowed us to meet other amazing gamedevs in the industry and get more exposure. We cannot wait to start full production of our next project and hopefully have a fan base to interact with!